Use the table below to learn about the different audio settings and when to select them. Dolby Digital You have a TV or unit that can receive and decode Dolby Digital surround sound, select this setting. Use either the Digital Audio, SP/DIF, or Optical Audio port on the back of the cable receiver. The receiver is connected to the TV using an HDMI, select this setting. HDMI delivers digital stereo. The HDMI option appears only when the cable receiver is connected to your system using an HDMI cable. If you keep the HDMI connected, you can still set up either the two-channel only RCA / Optical audio cables and setting, or the Dolby Digital RCA / Optical cables and setting. When set up, the two-channel only or Dolby Digital cable connections and audio settings simply disable the audio portion of the HDMI stream. Two Channel Only You want Left and Right (L / R) stereo or two-channel Prologic digital audio from an RCA Digital Audio or Optical port, select this setting. Use the following example of a back panel to identify ports. The red boxes show the RCA and Optical Audio Out connections. On the back of the receiver are the following ports. Three sets of stereo L / R (Left / Right) audio out ports - They use audio cable connectors called RCA. One Digital Audio Out port - It uses a special digital coax cable with an RCA type plug. One Optical Audio Out port - It uses an optical audio digital cable and connector. Depending on your receiver, connection port availability and placement vary. The first column labeled ARCHIVE has three ports below it: Video, Left (L) and Right (R). Together these are a set. The next section, labeled OUT 1, has nine ports under it. The Video port could also use the other audio L / R or Digital Audio ports in the section. 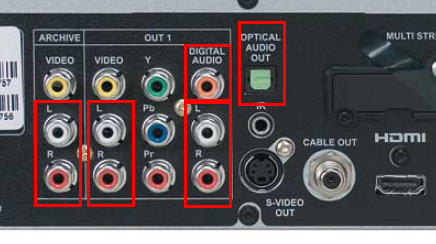 The HDTV (Y / Pb / Pr) video could use any of the audio ports in the section. The Optical Audio Out port can be used with either the Video or Y / PB / Pr ports in the OUT 1 box. Which receiver type do you wish to change the audio settings on?